The safety of any scaffold at a construction site is essential, especially because there are various hazards that are related to the way it is erected, dismantled or the work carried out from it. However, as much as emphasis is put on the safety of scaffolds, there are also rumours, confusions and misunderstandings that go round about scaffolds. Some of this misinformation may have come about as a result of rules and regulations of Occupational Safety and Health Administration about scaffolding. We should disregard the mistaken belief and focus on the practical insight offered below about scaffold safety. The first thing to consider when evaluating a scaffold’s safety is how to establish and be able to maintain a working surface that allows you freedom of movement. This is vital because a scaffold is intended to be temporary during which time it will be elevated and you will be expected to walk as you work on it. Scaffold’s basic regulations focus on three important principles. First, scaffolds are mainly used for safe access of work that is beyond reach as long as you are on the ground. Next, scaffolds’ erection and inspection ought to be done by someone who is either competent or qualified to do it. Qualifications or competence requires a degree or certificate that is recognized. Extensive knowledge, experience or training and proper demonstration of what is expected can also count as qualification. Lastly, anyone working from scaffolds must have undergone training. Applying these principles is very simple. However, the confusing bit slides in because there are no specifications on the way in which you should address every condition in the working site. The decision making for the scaffold to work in a certain manner is mostly left to you. There are those applications that do not require critical thinking since they are straight forward. If for instance you were to wash windows, the design of the building and the windows’ configuration is what will determine whether to use needle beam or swing stage scaffold. Commercial construction has received so much attention during scaffold hire compared to residential construction. The issues faced by the workers in this type of construction are not looked into as much. Processes like lying of bricks, setting of rafters, siding installation and roofing application takes on a completely different approach which brings about various issues that require solution. 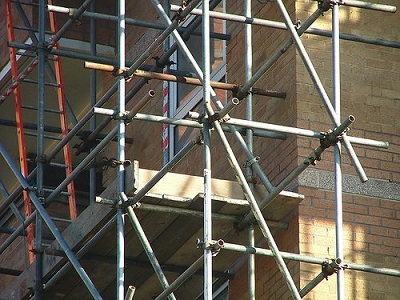 Occupational Safety and Health Administration has been recently been focusing on residential construction and has issued citations that are associated to scaffolding and fall protection. A cultural shock has fallen upon residential contractors as their issues are being prioritized. However, the resources required are limited and the applications on scaffolding do not have a clear definition compared to other industries. The first thing on the checklist is the condition and the right procedures to follow to enable you deal with electrical vulnerabilities. Next, we have the condition and proper ways of maintenance, erection and stripping fall protection structures. Then there is the proper use and handling of the scaffold and whatever materials on it. Finally, there is the intended maximum load and what the scaffold points out as its load carrying capacity.